World Trade Center New Orleans, located at 2 Canal Street in the Central Business District of New Orleans, Louisiana, is a 33-story, 407 feet (124 m)-tall skyscraper. It was formerly known as the "ITM Building", i.e., the International Trade Mart, and was constructed to a design by Edward Durrell Stone. 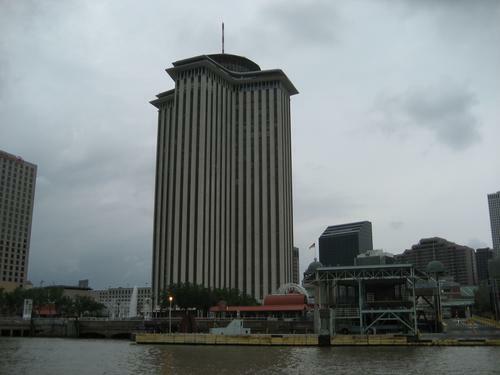 In its heyday, the World Trade Center housed numerous foreign consulates and the headquarters for the Port of New Orleans. The top floor hosted a cocktail lounge called "Top of the Mart" from the 1970s through 2001. The bar slowly rotated once per hour. After this a bar called "360" (as in degrees) opened in its place, which remained until Hurricane Katrina in 2005, and has since re-opened. The floor below holds the Plimsoll Club. The Honduran Consulate of New Orleans is also located in the building..